seat covers seat covers ACM seat covers and cushions: where aesthetics and comfort come together. We work with equal devotion on the design & production of VIP luxury jets and commercial aviation cabin interior delivering seat and dress covers made of various materials and in different styles. 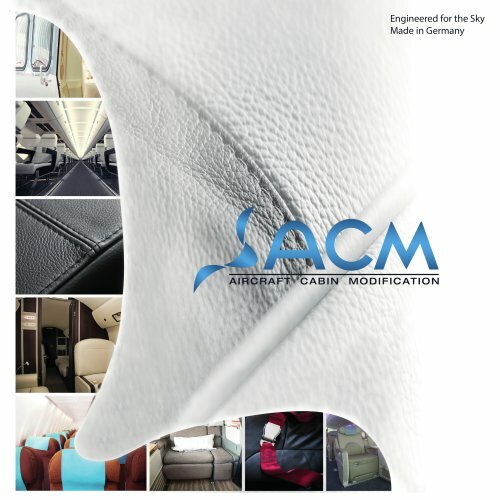 Most commonly used materials are fabric, real and artificial leather, Alcantara, sheepskin as well as laminated covers created for every purpose 6 from General Aviation to VVIP level environments. pilot seatingcrew seating & pilot & crew Latest machinery and proven techniques realize premium products for long and short distance flights. ACM realizes unique, custom-built solutions for special projects and takes over serial production of aircraft & helicopter seat cushions. A reliable supply chain with renowned manufacturers of high quality rug material: this is the core of our in-house production of stressable carpets for General Aviation and custom-made special carpets for highclass interiors. ACM aircraft interior designers advise on the choice of fabric and color to realize the customer’s dream and create a personal experience. Highly skilled professionals turn the materials into carpets suitable for any need and in any color. certified belt overhaul certified belt overhaul A seat belt is inevitable in any vehicle and is just as essential for passengers and pilots. In collaboration with EASA and a renowned testing facility ACM’s in-house design organisation developed a testing method for static and dynamic conditions to verify the equivalence with the webbing specifications of the original manufacturer. As the single independent maintenance organisation for seat belts and restraint systems in Europe ACM offers cleaning, exchange of re-webbing and complete overhaul with the according EASA documentation. cargo nets cargo nets We use only high quality materials to deliver a product that can withstand high loads and frequent usage and thus will serve the customer for many years. doa services doa services Our DOA approval covers any factor of cabin soft furnishings: we can assist you with certified design, production and refurbish of the complete cabin interior. Our design organization supports you throughout the whole completion process by consulting on design, materials selection & feasibility, to finally deliver a bespoke state of the art product. seat cushions seat cushions Different types of graphite based polyurethane foams guarantee light weight seat cushions with high comfort seating experience. We procure our foams from traditional, leading companies and process them to seat cushions for pilots, crew and passenger seats, as well as mattresses in the rest areas. armcaps armcaps With ACM’s complete upholstery with cushion and surface materials our client receives not just a product, but the promise of durability and long-levity of one of the most frequently used product. prototyping prototyping Development of a prototype means the visualization of customer’s dream. Therefore, high class engineering skills and experience as well as quick completion are crucial. In the past our dedicated teams have consulted various clients while also providing solutions for an efficient and improved final design. Many years of technical expertise enable us to plan and manufacture unique commercial and general aviation cabin interior projects: from design and development, to the final production of the prototype and its certification. seat attachment parts seat attachment parts By producing and overhauling literature pockets, life vest pouches, headrest covers ACM is more than upholstery. We only need the structure to deliver ready to install seats. dry services cleaning services dry cleaning Gentle to fabric, environmentally friendly, cost-effective and fast. ACM is one of the few providers of cleaning services with an in-house facility and a dedicated, trained team. Dress covers, curtains, lap belts and restraint systems or any other textile cabin equipment can get refreshed and will be delivered with the required documentation and re-certified.